Free Wi-Fi and a central location near the Biedenharn Coca-Cola Museum add up to a sweet stay for guests at the Relax Inn Downtown Vicksburg. 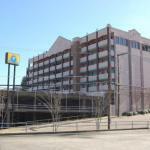 The six-story Relax Inn offers well-appointed rooms featuring mini-fridges microwaves and cable TV. Wi-Fi is on the house. Guests take advantage of the on-site laundry facilities when it's time to freshen up their wardrobes. Parking is free and pets are allowed at the hotel. Conveniently set in downtown Vicksburg the Relax Inn is a five-minute stroll from the Vicksburg Convention Center and the Biedenharn Coca-Cola Museum. In less than two miles guests reach Vicksburg National Military Park. Keep driving in the same direction to get onto I-20 five minutes away. Jackson - Medgar Wiley Evers International Airport is 53 miles east of the hotel.